I've posted previously about my Pythonista workflow for resizing and uploading images to my FTP host for Macdrifter.1 I translated this workflow for Editorial but decided that wasn't much of a challenge. 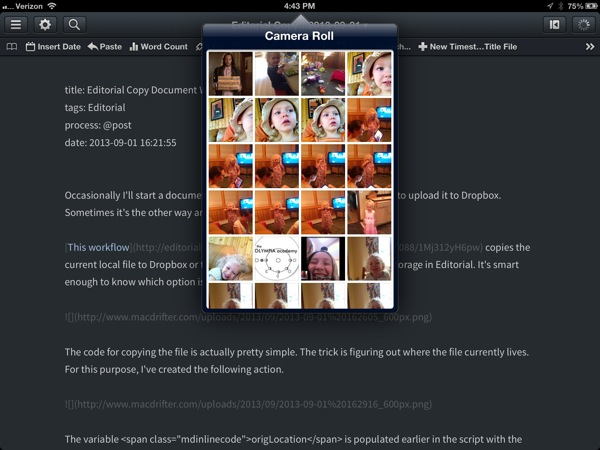 If you want to use an image from the camera roll, Editorial provides the standard image picker. 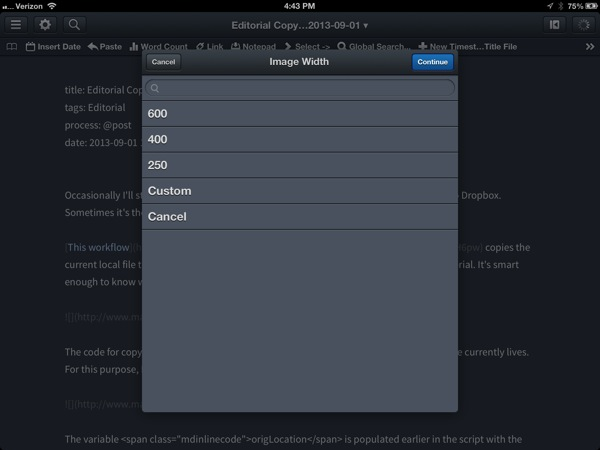 After selecting the image, there's a list of resizing options. I have a couple of my standard image width sizes plus an option to enter a custom width. The image is then resized proportionally to fit the selected width. The workflow also asks for a file name and appends the current timestamp to the end before uploading to the appropriate web server location.3 The timestamp helps to avoid overwriting an existing file with the same name during upload. I also like timestamps in file names. After the file is uploaded, we get a confirmation and the URL for the hosted image on the clipboard. I've also chosen to put a bit of information on the console. This might be annoying to some, but I like having the running history. I'm displaying the resized dimensions, the image and the URL to the hosted image. The heart of this workflow is the Paramiko module, which is a very good SSH module. I used this module in my other SFTP workflow for uploading text documents. This module comes with Editorial and Pythonista. I think that's really cool. The sftp.put(remotepath, localpath) method just does a simple file transfer from one location to another. Easy-peasy. But this workflow is a bit harder. Where is the image on the clipboard or camera roll stored? We'd need a file path if we wanted to use the put() method. Maybe there's a better way. One way to work with files without storing them in the file system is to create a file in-memory with BytesIO from the IO module. This lets us store a non-text file in memory as a binary object and use it like it's a real file. One problem though. There's no file path that we can use with the put() method. The benefit of working through Paramkiko is that it's really an SSH connection in disguise. 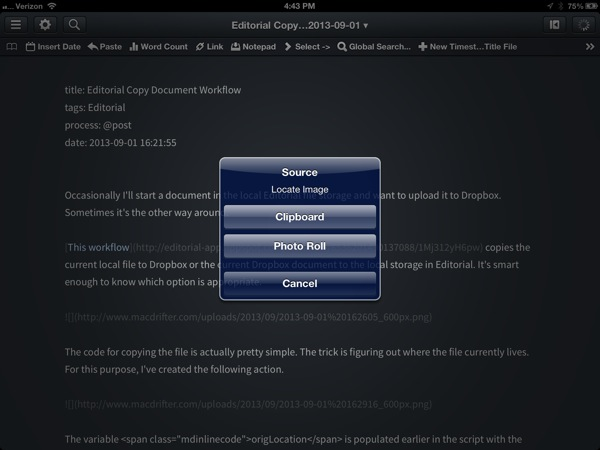 That means we can do some useful file operations like opening and writing files. 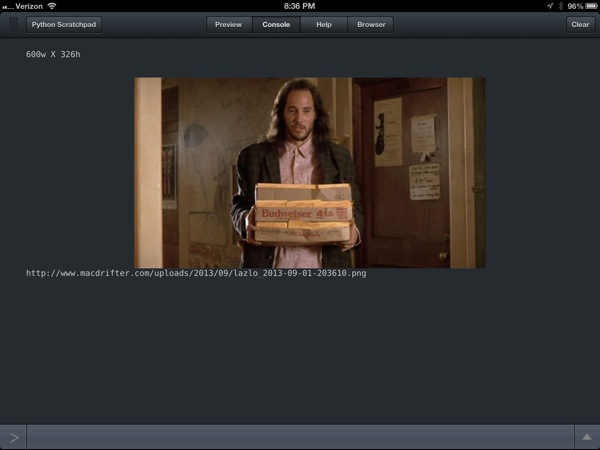 Now back to the little trick of writing a file from memory onto the remote host. Pretty neat. The open() method creates a new file at the indicated path and file name ready to receive some binary data. Conveniently we had a binary object in memory to stuff in there. Now that we know how to do the really tricky bit, let's backup and checkout some of the other tricks in this workflow. 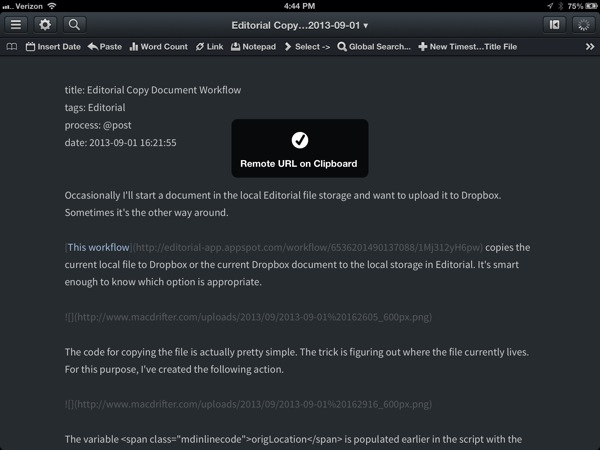 Take a look at my previous workflow for viewing the clipboard. It has all the explanation. I wanted the option to use a couple of standard image sizes. I typically resize images to a specific width. To allow multiple options I use the pop-up selection list available in Editorial and save the selected value to a variable. The list selector is a nice way to provide a variety of choices without displaying really ugly popups. This is pretty straight forward once you appreciate that an image object has a width and size property available through image.size. After we have the image's actual size we just need to figure out how to proportionally downscale it. I never want to upscale my images so I only resize if the current image width is larger that the new requested width. The BytesIO() method creates a place in memory that holds a file. Next, we tell our image, conveniently saved in the image variable, to save to this in-memory file object as a PNG. Finally, we tell the file object to reset it's current read/write position to the beginning of the file using buffer.seek(0). This way when we start reading from our file object we know we will start reading from the beginning. That's pretty much it. The rest is just some date manipulations to make sure we are uploading to the write directory and to create the URL to the hosted file. There's not much interesting in there. This post is self serving. By highlighting some of the interesting Editorial modules and Python tricks, I'll get others to make even more powerful workflows for me to steal.